In episode 7, Rey has a vision when she encounters Luke's lightsaber. I didn't watch it frame by frame, but I thought part of it included Kylo Ren in a mask, forcing someone to kneel. I interpreted it as the destruction of the Jedi temple, and Ren making the final break from Luke. However in episode 8, we are treated to several flashbacks of the event, which appear to be visually different from Rey's vision. 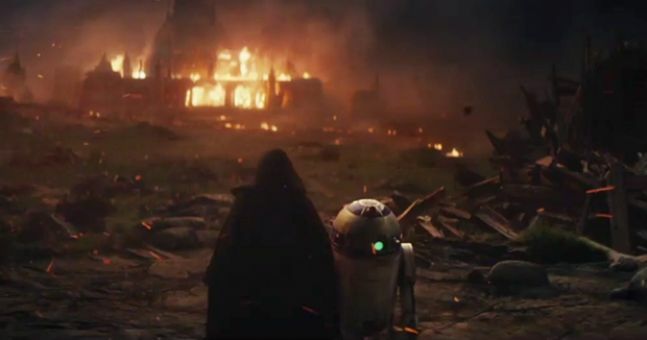 Does Rey's vision in episode 8 include the destruction of the Jedi Temple? We see some guy holding a staff who gets skewered by Kylo Ren. In the rain. It not clear if this connects to the burning of the Temple. TLJ adds some context (like why Ben turned), but you'll note that it was intentionally vague on details (who burned the temple? How long was Luke out? How did Snoke get into the picture?). But, most importantly, these are flashbacks of what actually happened, as opposed to a Force vision. None of what's in Rey's vision is mutually exclusive of what we learned in TLJ. First a recap of the vision. Everything else from her vision is either before or after that. Even before she touches the saber the 'visions' have already started. That is what draws her to the saber to begin with. They actually start at about 64 minutes into the movie. As she is standing in the bar and walking down the stairs we hear the CC discloses that we can her a young Rey screaming "NO!" and "NO, come back!" and etc. So then she is 'transported' to some hallway and we hear young Rey again and we hear Yoda say "Its energy ... surrounds us ..."
Then Rey turns to see her young self [they have the same hair style too] screaming again on Jakku with Unkar telling her "Quiet Girl" as we see what we assume is her parents leaving the planet in some ship. Then the sun in the distance turns into a slit with some bright red light emitting from it and we hear Obi-Wan say "Rey?" and she turns and starts running in some woods straight into Kylo. Then she falls backwards and back into Maz's basement and we hear Obi-Wan say "These are your first steps" and the vision ends. From the start of the full on vision to its end is about a minute. It goes from about 64 minutes to about 67 minutes in full. First there is Rey being left on the planet as a child. She thinks that her parents are coming back for her, but the Jedi remind her that they left the planet without her. No matter where they are (alive or dead) they are not coming back. They ?sold? her to Unkar and left her. They want her to know it is time for her to move on. Not the answer you're looking for? Browse other questions tagged star-wars the-force-awakens the-last-jedi or ask your own question. Is this character a Jedi? In Rey's vision, whose voice says “These are your first steps”? Could Luke's lightsaber call to Finn instead of Rey? Which predictions of The Last Jedi: Darths & Droids Bingo were correct? Is Kylo Ren right about Rey's parents? Where did Ben Solo get his red lighsaber and mask when attacking Luke's Jedi School? How could Kylo Ren move Luke's lightsaber in The Last Jedi when he couldn't in The Force Awakens? Who are the “Last Jedi”?